It's always important to bring something to drink on any trail, and our supply of water and Gatorade easily lasted the day. Sunblock or long sleeved clothing and hats are also important. Figure 3: A little bit of rain shows on Pokey's rear end. The rider in front is a Navajo guide, required for all visitors to Canyon de Chelly. Photo courtesy Joyce Fay. After our ride, we trailered to the Thunderbird Lodge at Canyon de Chelly and enjoyed a meal at the cafeteria. We overnighted at the Lukachukai Trading Post, where Vicki and her husband Hank have private corrals. The next day we rode for a few hours on the reservation before returning to Albuquerque. The horses and riders had a great time, and we agreed to do it again in the fall in Monument Valley. If the buckskin is still not for sale. 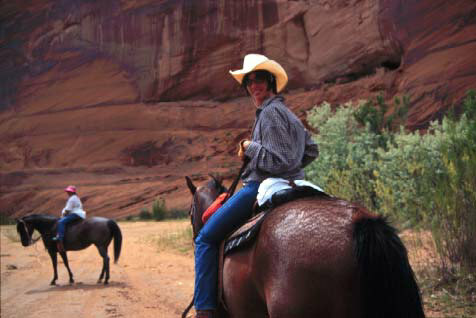 Anybody who wants to ride through Canyon de Chelly can call one of the rental stables. Justin's Horse Rental, near the mouth of the canyon, and Tohtsonii Ranch, near Spider Rock, at the top, offer guided day rides and a variety of overnights in the canyon. They also provide guides for people who bring their own equine, and offer some overnight boarding. It's about a 5 hour haul with a 2-horse load, including a rest stop. It's a good idea to start the paperwork required for out of state travel a couple of weeks ahead. You need a "travel card," or Horse Transportation Permit, issued by the New Mexico Livestock Board, a health certificate from a vet, and a "negative Coggins" report, which is blood test. My horse had some cuts in his mouth from something in his hay, and the vet said we would need a blood test to rule out Vesicular Stomatitus. He arranged to have an inspector from the State come out to take the samples (this service is free of charge), but it took a couple of days to receive the test results showing that the horse was disease-free. The best riding weather is expected in September and October. The footing can be deep sand, which is slow, or packed sand, which is easy to travel, depending on rainfall. There are many shallow water crossings and little shelter in the canyon. Horse rental is $10 per person per hour, plus $10 flat fee for the guide (one fee for the whole party). If you bring your own horse, it's $5 per hour per person plus $10 flat fee for the guide and the permit. Justin Tso provides overnight stalls for a nominal courtesy fee. Water is hauled to the horses every day. You can camp at Justin's and sleep near your horses. Similar rates. The trail is very steep from Spider Rock down into the canyon. If you're not certain your horse can manage the trail, it's recommended that you rent one of their horses. Allow 2 days notice to schedule an inspector. If you live in another state, check with yout local livestock board. Arizona requires a current health certificate (within 30 days) from your veterinarian, and a Negative Coggins. Leave a full working day for the lab tests. Want to learn more about Joyce Fay? See her dog rescue web site at http://www.joycefay.com/. © 2002 Amy Marash. All rights reserved.